So Microsoft just released it’s final version of Internet Explorer 9 to the world (you can get your hands on your own copy here) and we’ve got to say it’s a huge improvement from previous versions. Although not a HUGE amount has changed, Microsoft has done enough to make it a pretty day to day browser again and for sure should be something to compete with the likes of Chrome and Firefox again. Some of the awesome new features are its new minimalist style. Besides the tabs at the top, there’s nothing else really to this beautiful browser. They’ve also polished up the graphics with some funky transparencies. Besides the looks immediately you’ll be able to tell it’s a lot faster than previous versions, and this should make EVERYONE happy. They’ve also made that address bar up there ^^ a little smarter by incorporating searches directly in them. Now we mean instant, start typing and you start receiving. The default search engine is Bing (of course) but this can be customized by using another neat little feature the browser Add Ons (which can be accessed through the address bar as well) This lets you use any popular searches like google, wikipedia or even facebook. 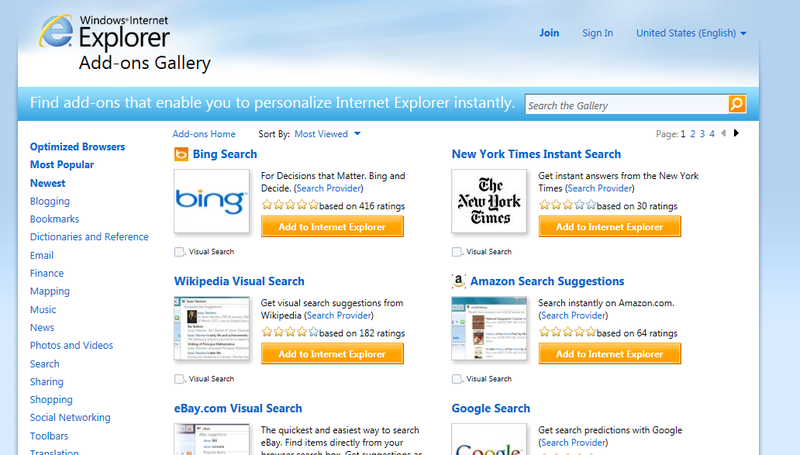 All in all these changes are all welcome and we’ve enjoyed our hands on with the new face of IE and look forward to more improvements along the way. Want to be a real Ubisoft Assassin? Check out this video!